You'll want to see everything when you travel to Prague. 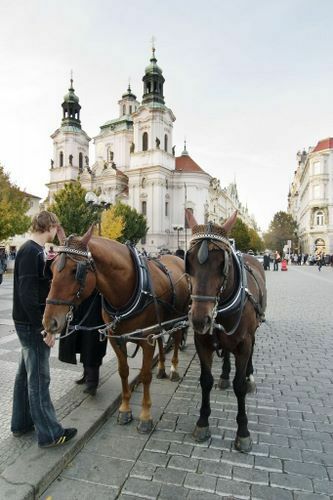 Tour the city by organized tour bus, with a map on foot, on the Vlatva River by boat, or romantically by horse-drawn carriage. This photo tour takes you through some of the interesting sites of Prague that aren't included in the other photo tours on this site. The National Museum in Prague's New Town is located on Wenceslas Square. It hosts geological, paleontological, and zoological exhibits. In addition, it displays a collection of antique Czech puppets. Most visitors enjoy the exhibits at the National Museum, but it isn't for everyone. While the geological collection is interesting, other exhibits lack popular appeal. The interior of the National Museum contains a beautiful red-carpeted stairway and hall. Concerts are sometimes held here. The National Museum is open 10-6 May through September and 9-5 October through April. Usually open daily, it is closed the first Tuesday of every month. Additionally, visitors pay no entry fee the first Monday of every month. No. 22 Golden Lane was actually Franz Kafka's sister's house, though he is known to have stayed and written there. This cheerful blue house is just one of the many colorful dwellings along Prague's Golden Lane, which is tucked behind Prague Castle. Stroll along the Golden Lane to capture some charming photographs, or shop for Czech souvenirs. On Charles Bridge, there is a place on the statue of St. Jan on which visitors can place their hand to make a wish. Choose Queen Sofia, and keep a secret of your choice untold forever; choose the image of Jan being tossed off Charles Bridge, and you'll return to Prague. The German Embassy is located in Prague's Lesser Quarter, or Mala Strana. The gorgeous building has gardens around the back. In these gardens you'll find a sculpture by David Cerny of a golden Trabant that pay tribute to the thousands of East Germans who slipped into West Germany via the German Embassy in Prague, leaving behind their East German cars. An additional piece of trivia: David Cerny's sculptures can be seen in various locations throughout Prague. He has left his mark on the Zizkov TV Tower by attaching to it crawling babies. In another area of Prague, a man hangs by one hand from the roof of a storefont. Climb the steps to the Petrin Tower to get great panoramic views of Prague. This tower, a copy of the Eiffel Tower (but one-fifth of the size) is made from recycled railroad tracks. Petrin Tower is located in Petrin Park. Petrin Park contains the Mirror Maze (it is just what its title suggests - a maze of mirrors), the Hunger Wall (a 15th century project to employ Prague's poor), and the Stefanik Observatory. A tour of the Municipal House is sure to delight. This Art Nouveau beauty is detailed with mosaics, curved glass, sculptures, stained glass, and other artistic touches throughout. Leading turn-of-the-century Czech artists collaborated on designing parts of the Municipal House in the beginning of the 1900's. The Smetana Hall is home to Prague's Symphony Orchestra. The City Mayor's Hall features work by Alfons Mucha. You can even find refreshment at the Municipal House at the French restaurant or Czech pub. Built during 1992-96 by Frank Gehry and Vladimir Mulunic, the Dancing Building is a piece of controversial Prague architecture that the locals still aren't sure about. However, the delightful design of the building, nicknamed "Fred and Ginger" for the way the building mimics the forms of a dancing couple, is usually a prime object of photography for tourists. Celeste Restaurant and Bar, formerly La Perle de Prague, housed on the top two floors of the Dancing Building, is a French restaurant that that is proud to offer diners panoramic views of Prague and an extensive wine menu. Stop in for a drink or dinner, or simply marvel at this building from afar. Just 20 km outside of Prague, Karlstein Castle is an easy and popular destination for Prague tourists. Royal artifacts (like the Wenceslas Crown), ancient artwork, and portraits of Czech rulers can be seen here.